The top and bottom of each box represent the 25th and 75th percentiles (ie, the interquartile range), the horizontal line inside each box represents the median, the whiskers are the 10th and 90th percentiles, and any outliers are shown as circles. Patients who received a diagnosis of colorectal cancer and who underwent a percutaneous coronary intervention represent a unique population with competing goals for timing of surgical care. The 2014 guidelines on perioperative management1 recommend delaying elective surgery for 30 days for bare metal stents and for 6 months to 1 year for drug-eluting stents. The current literature presents conflicting results regarding whether delay in the surgical treatment of colorectal cancer affects outcomes.2,3 We sought to determine whether the presence of a coronary stent affected the timing of colorectal cancer resection and the postoperative outcomes. Patients with a history of coronary artery disease who underwent elective resection for colorectal cancer were identified from a previously described cohort of Veterans Affairs (VA) patients.4 Patients with a coronary stent were identified in the VA Medical SAS data sets. Surgical data were collected from the VA Surgical Quality Improvement Program. The date of the colonoscopy, with a corresponding International Classification of Diseases, Ninth Revision cancer diagnosis code preceding surgery, was identified using VA and Centers for Medicaid and Medicare Services administrative data. This study was approved by the institutional review board of the Birmingham VA Medical Center with a waiver of informed consent. An α level of .05 was considered statistically significant. The primary outcome of interest was the interval from cancer diagnosis to surgery. In addition, we examined the secondary outcomes of a major adverse cardiac event (MACE) within 30 days of surgery and 1-year mortality. The composite outcome of an MACE was defined as a myocardial infarction, a coronary revascularization, or all-cause mortality. We identified 632 patients with a history of coronary artery disease who underwent elective surgery for colorectal cancer. Of these 632 patients, 196 (31.0%) had a coronary stent placed within 2 years prior to the surgery. There was no difference in Revised Cardiac Risk Index scores based on the presence of a stent or the timing of placement relative to surgery (P = .96). For patients who received a stent prior to a diagnostic colonoscopy, drug-eluting stents were more common (54.0%), and the majority of these were placed for acute coronary syndrome (66.7%). For patients who received a stent following a diagnostic colonoscopy, bare metal stents were more common (85.7%), and the majority of these were placed for a non–acute coronary syndrome indication (68.6%). The median time from diagnosis to surgery was 100 days for patients who received a stent after a colonoscopy and 42 days for patients whose stent was present at the time of the colonoscopy (P < .001) (Figure). For patients with intervening stents, the median delay in surgery did not differ by Revised Cardiac Risk Index (P = .44), history of recent myocardial infarction (P = .34), or cancer location (P > .99). The 30-day MACE rate in the cohort was 5.9%, and differences in 30-day MACE rates (4.8% for no stent, 7.1% for stent placed before colonoscopy, and 10.0% for stent placed after colonoscopy) were not statistically significant (P = .18) (Table). The 1-year mortality rate in the cohort was 9.7%, and neither the timing of the placement of the stent relative to surgery nor the time from diagnostic colonoscopy to surgery was statistically significantly associated. In our study of patients with coronary artery disease undergoing surgery for colorectal cancer, we found that the intervening stent placement was associated with an incremental 60-day delay in surgery. 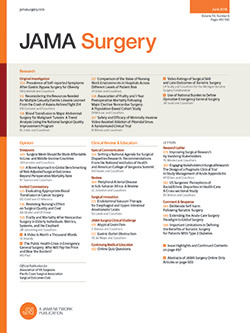 The delays in surgery for all patients in our cohort were longer than the 22-day interval reported for a VA-based cohort study by Paulson et al.5 The longer intervals in our cohort may be related to the complexity of the surgical decision-making process for patients with known coronary artery disease. In our study, patients with a stent showed a nonsignificantly higher MACE rate of 10% that is similar to the rates reported for other patients undergoing surgery within 60 days of stent placement.6 The urgency of a cancer operation may expose patients to additional risk by shortening the interval between stent placement and surgery, and this risk should be considered in the cardiovascular management of these patients. Corresponding Author: Mary T. Hawn, MD, Department of Surgery, Stanford University School of Medicine, 300 Pasteur Dr, M121 Alway Bldg, Stanford, CA 94306 (mhawn@stanford.edu). Published Online: October 21, 2015. doi:10.1001/jamasurg.2015.3130. Author Contributions: Dr Hawn had full access to all of the data in the study and takes responsibility for the integrity of the data and the accuracy of the data analysis. Study concept and design: Killian, Holcomb, Graham, Hawn. Drafting of the manuscript: Killian, Holcomb, Graham. Statistical analysis: Killian, Holcomb, Graham, Richman. Administrative, technical, or material support: Holcomb, Graham. Funding/Support: This study is supported by a Department of Veterans Affairs Health Services Research and Development Grant (IIR 09-347). Dr Holcomb is supported by grant T32 HS013852-11 from the Agency for Healthcare Research and Quality. Dr Richman is supported by a Department of Veterans Affairs Career Development Award. Role of the Funder/Sponsor: The Department of Veterans Affairs had no role in the design and conduct of the study; collection, management, analysis, or interpretation of the data; preparation, review, or approval of the manuscript; and decision to submit the manuscript for publication. Previous Presentation: This paper was presented at the 39th Annual Meeting of the Association of VA Surgeons; May 3, 2015; Miami Beach, Florida.